I am trying to think of a better name for these, but until I (or someone else) come up with something, kisses they are. This is a very simple treat that I learned how to make in Switzerland (but I don’t think that it is traditionally Swiss). There are three ingredients; marzipan, toasted hazelnuts, and chocolate. My favorite marzipan to use for this particular recipe is imported by my friends’ company, Purely Organic. It is very sweet, so a little goes a long way. I made about 60 candies with one package of marzipan, and I think that you could stretch it even more. 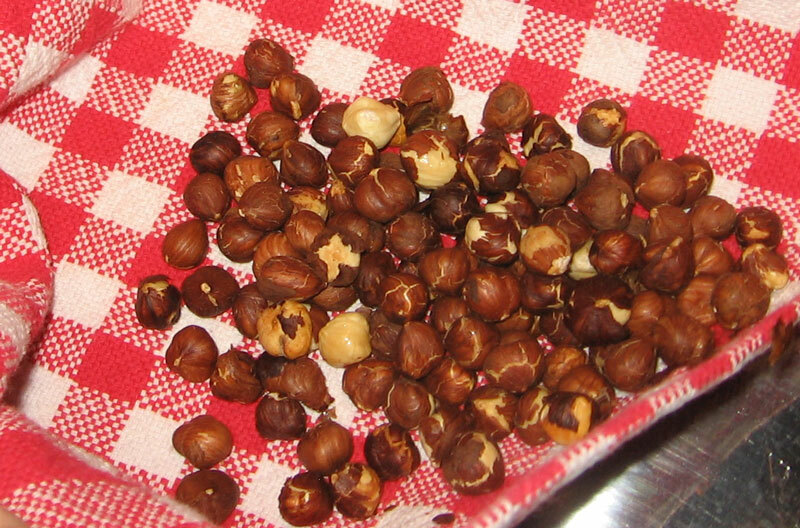 Toast the hazelnuts in a 350 degree oven for about 10 minutes. WATCH LIKE A HAWK. Over toasting nuts is one of the easiest things to do! 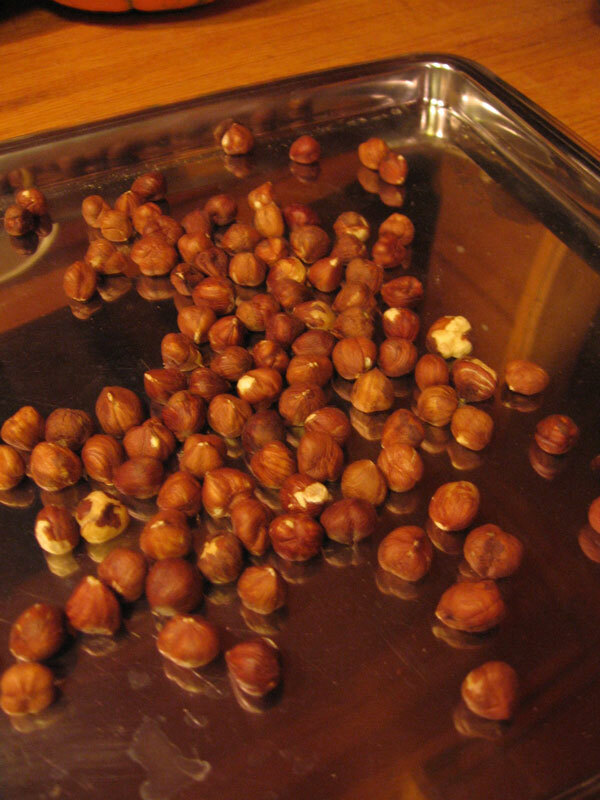 After the hazelnuts are toasted, the skins crack and are easy to remove. I usually place the nuts in a towel and rub them together until the skins come most of the way off, and then finish removing them with my fingers. Make sure to wash your hands when you are finished removing the skins, as you don’t want them ending up stuck all over you nice light brown marzipan. The next step is to pinch off a piece of marzipan and roll it into a little ball. 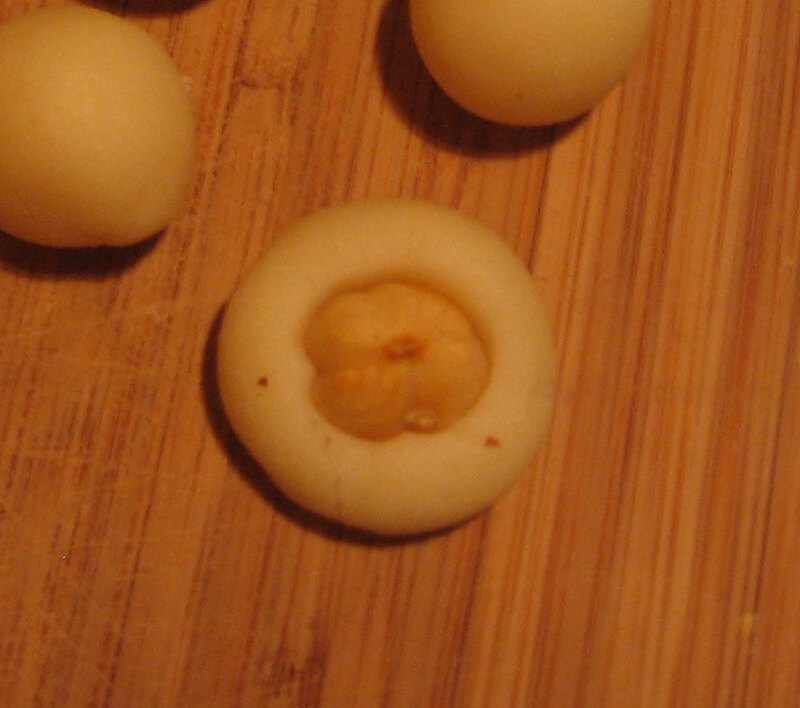 When you have made a few balls, press a hazelnut into the top. I like to have the point of the nut facing up. Because marzipan dries out quickly, it is important to do this in batches so that the edges don’t crack. 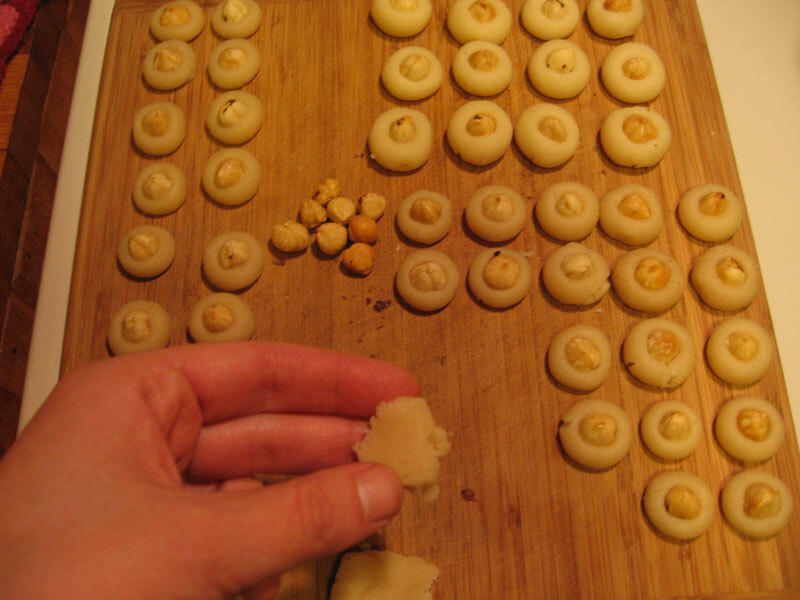 Make a few balls, add the hazelnuts, and continue like this. 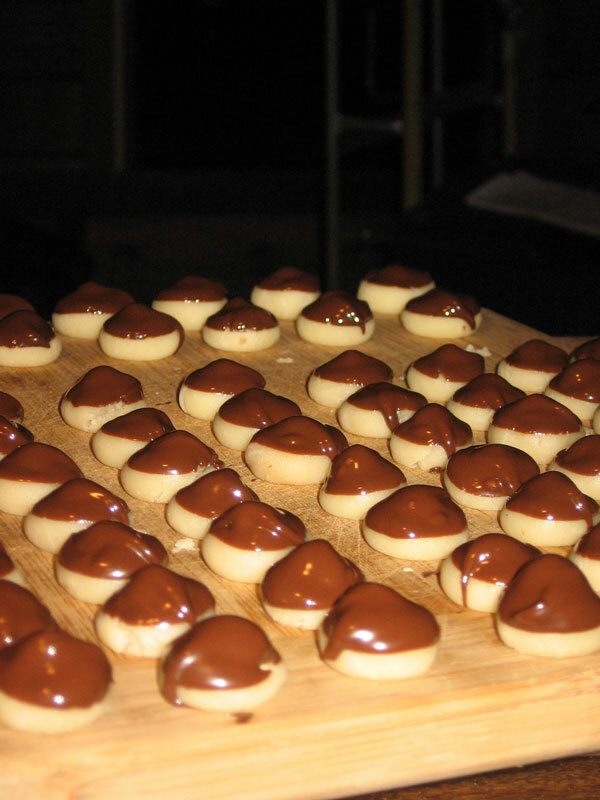 After the kisses are dipped, leave them out until the chocolate cools. oh my yumness! Those look fantastic! Torre, I love reading your blog! Kathy, they go really quickly. 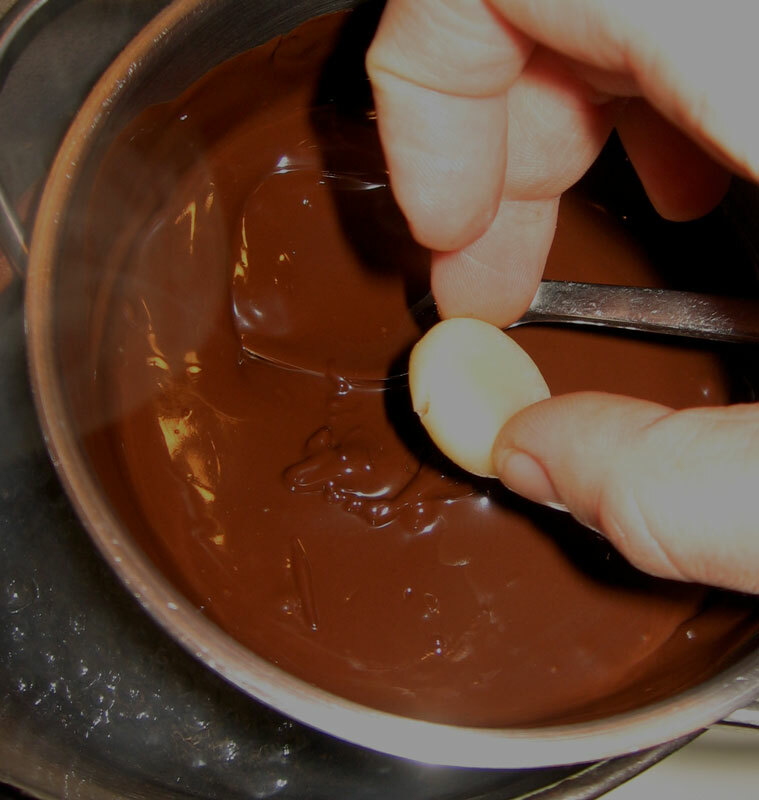 The only slightly tricky part is melting the chocolate, which isn’t really that bad. what happened to the left over chocolate? still stuck in the little pan…not sure what to do with it. I work for a large marzipan manufacturer in the UK and we make a large variety (of which I myself prefer the luxury and brandy-infused ones), but I am not sure you could easily get those in the States. Will definitely try those–so far my imagination of what to do with the stuff has extended to making liquored-up marzipans fully dipped in chocolate, or marzipan roulades filled with chopped nuts and then dipped in chocolate (fully, again). The idea is similar, but the kisses look oh so lovely. And everyone likes homemade sweets.